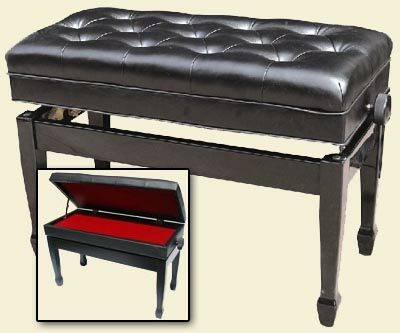 Duet Bench with Compartment with Free Shipping is rated 4.21 out of 5 based on 7 ratings. This beautiful bench is perfect for those looking for an adjustable duet that won't break the bank. Done in the same great type of sturdy finish that Yamaha, Young Chang, Petrof and other Asian and European piano manufacturers use - this duet bench is made of hardwood with a tufted vinyl matching top covering a 2" deep music compartment. Your choice of 3 leg styles, and 4 finish colors - this bench measures 30"x14" and adjusts from 18.5"-22"